McDonalds Happy Meals were created in the mid-70s by McDonalds marketing manager Bob Bernstein. He took the idea of a kids size portioned meal and added the toy element to it when he noticed his sons excitement when he pulled a small toy from a box of cereal. 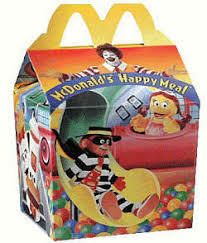 The Happy Meal officially rolled out nation wide in 1979 and the fast food world was never the same! Myself and many other people believe the Happy Meal hit it's stride in the mid-80s to early 90s when the toy offerings were almost as good as anything you would find on the shelf at Toys R Us. I grew up with these toys and have very fond memories of playing with them. These are my favorites from the 1980s! I was big into small pull back cars around the time these guys came out. My favorites were the Penny Racer cars put out by Takara. This set consisted of 4 cars including Ronald, Hamburgler, Officer Big Mac and my favorite of the bunch Birdie! She was my favorite because she was the only pull back car that I received during this promotion and she was AWESOME! I always questioned what Birdie was meant to represent? Fry Guys were French fries, Mayor McCheese was a cheeseburger was birdie meant to represent chicken? Was I eating Birdie with every delicious bite of my McChicken Sandwich!!! No, eventually the mystery was solved and she was created to represent the early birds who woke up for a nutritious McDonalds breakfast. Mystery solved and tears diverted! I was a huge fan of Fraggle Rock! My Mom even got me and my brother a Weekly Reader subscription so we could get the Fraggle Rock books and record! I still read those books to my kids today. Jim Henson really knew how to capture kids imaginations and these toys let us use those imaginations to come up with our own Fraggle adventures in the comfort of our own homes. I had all 4 of the vehicles and would use them to race other cars only to leave them in a puff of healthy vegetable dust! 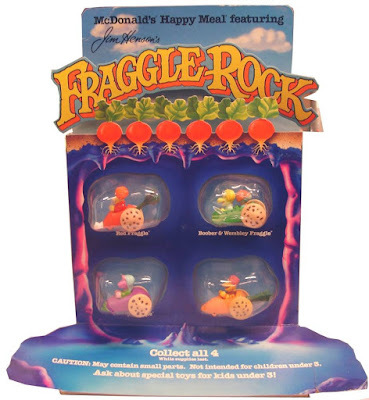 Sometimes the toy you received with your Happy Meal was the box! These boats came in 2 pieces and your food was inside! These came with sticker sheets and you could decorate them however you wanted. Some people may have felt cheated by getting these "toys", but I loved mine. I would put my G.I. 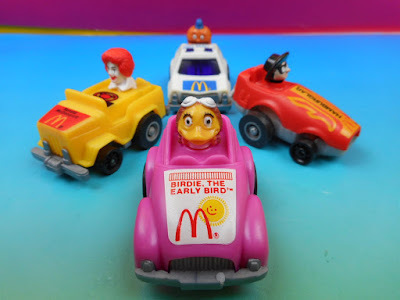 Joes or Bionic Six or whatever characters I wanted into my McDonaldland boat and float them around the pool, tub or even the puddles in our driveway. Eventually they did crack or break, but man were they fun when they were in one piece! Jim Henson does it once again with the Muppet Babies! 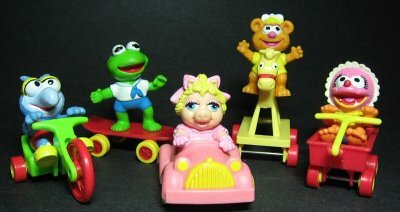 These were outstanding toys, because unlike the Fraggle cars you could actually remove the characters from their vehicles and have them mingle with your other action figures. I always wanted to recreate the Star Wars episode of Muppet Babies and now I could! 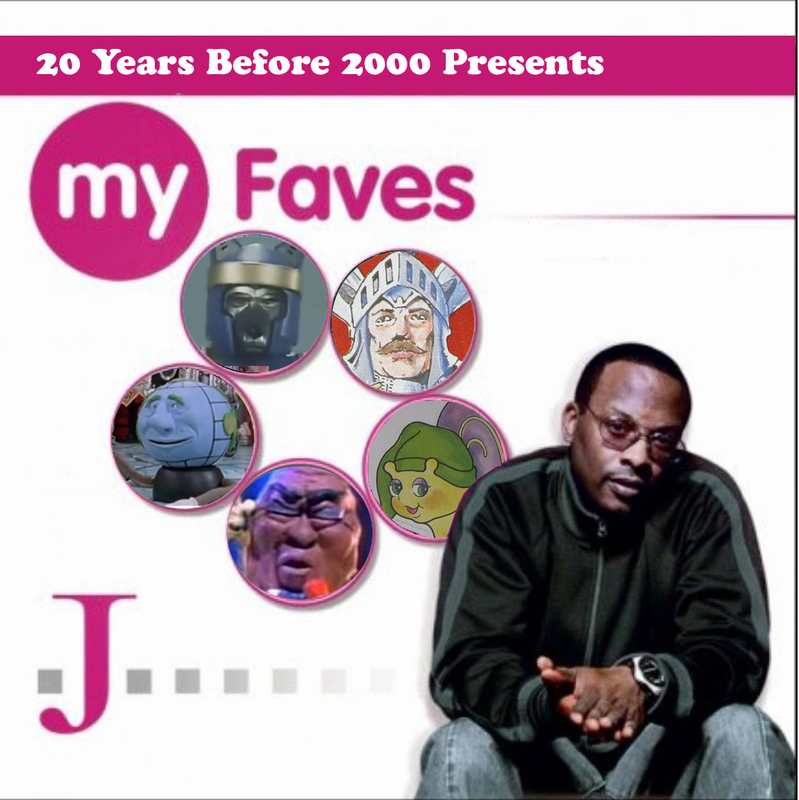 The original line included Kermit, Gonzo, Fozzie and Piggie. It wasn't until years later that I learned an Animal toy was made for Canada! Luckily I scored one pretty easily on E-bay and he was reunited with his adopted brothers and sister. Also, I just learned that the Canadian version of Gonzo was barefoot whereas the US version had shoes! Why? In the late eighties into the early 90s Garfield was huge. You could find him everywhere from fruit snacks, to TV, to your Moms car window. I loved Garfield, so when these came to McDonalds I had to have them. The only one I did eventually get was the jungle version in the blue Jeep. The only thing that would have made this line better would have been if they included more removable characters like Odie or Nermal. Still totally cool though! 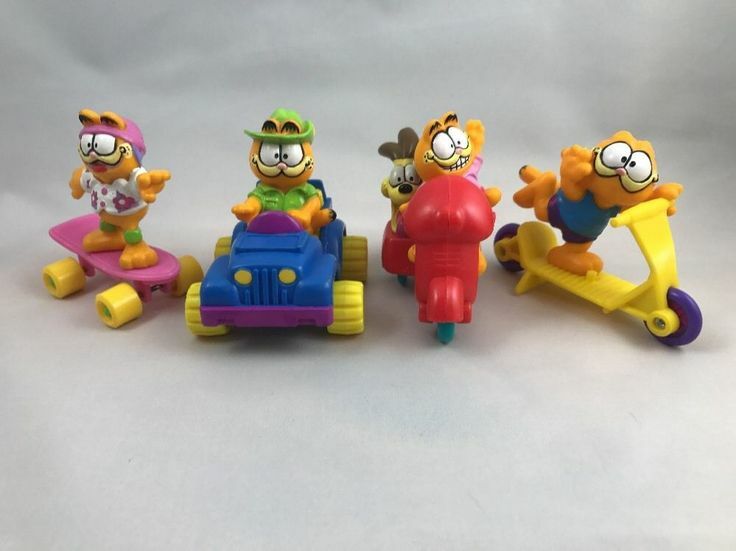 Well, there you have it...my top 5 Happy Meal Toys from the 1980s. Of course this is just my opinion. 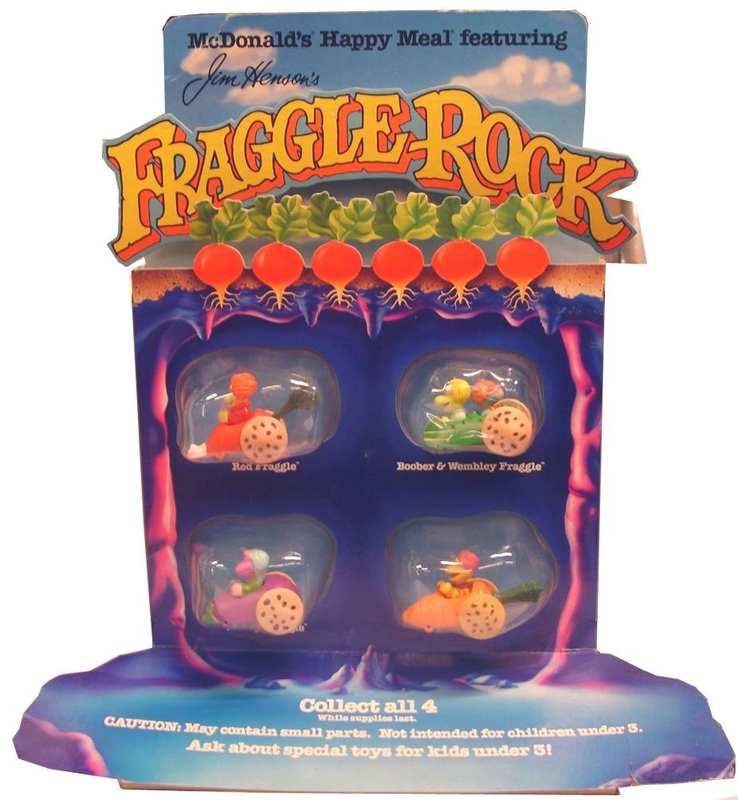 What were your favorite Happy Meal toys? Grab a Big Mac, contemplate what the hell Grimace is supposed to be and let us know in the comments below! 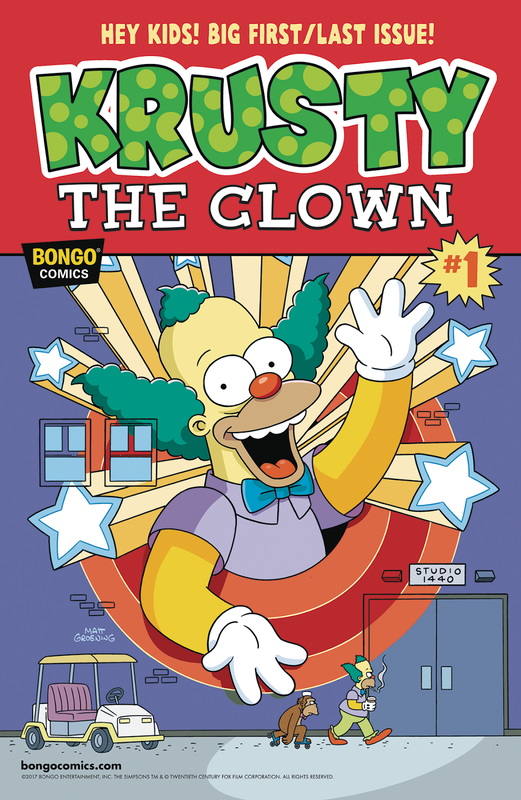 Bonus Fun Fact: This song was featured in the 1991 soundtrack for the movie "House Party 2"
Krusty the Clown finds himself alone and wandering the empty streets of Springfield, not a friend, neighbor, debt collector, or annoying fan in sight. 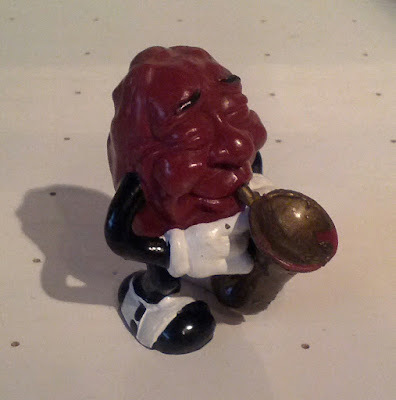 All that he is left with are his memories of a life in showbiz lived to the fullest-a little song, a little dance, and a little seltzer down his pants. But where did all the people go? It would appear that he is the Laugh Man on Earth! 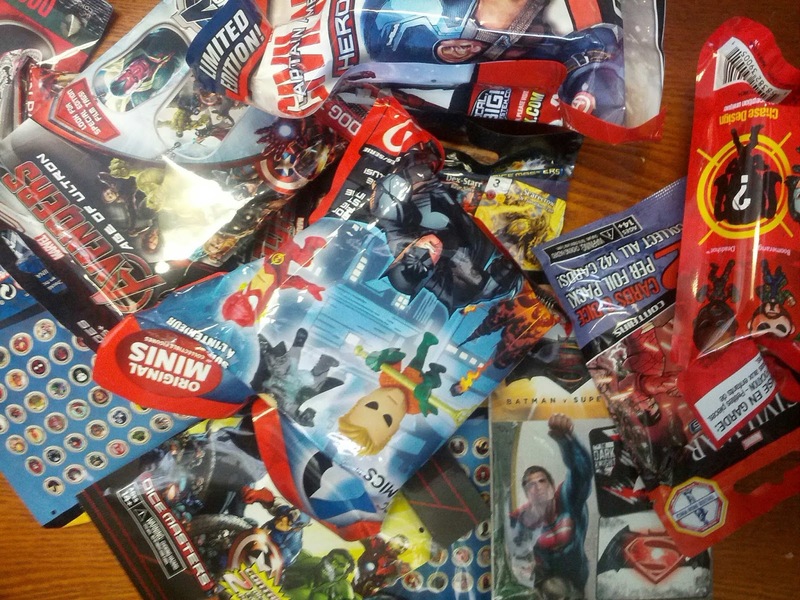 What's inside the Superhero Collector Box!? There were 3 packs of the Dice Masters game which included the Civil War, War of Light and Age of Ultron variety. 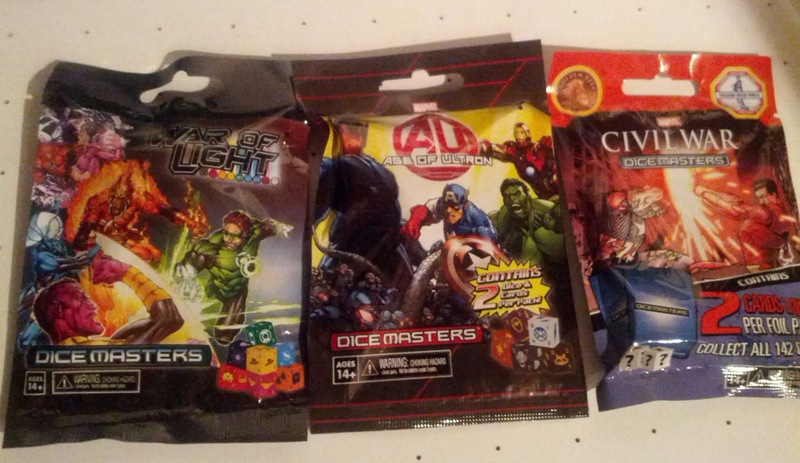 Each pack contains 2 cards & 2 dice. I have never really been excited about this game. Yes, I know the packs are cheap, but I was never drawn in. 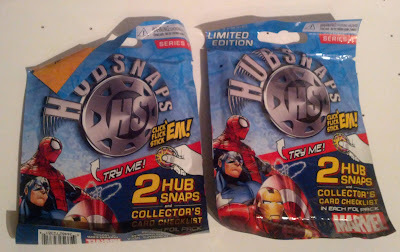 I know it has it's fans and now I have 3 packs, so maybe I'll give it a shot? There were 2 packs of Dog Tags in the box for the Avengers: Age of Ultron & Suicide Squad movies. I have no use for these. 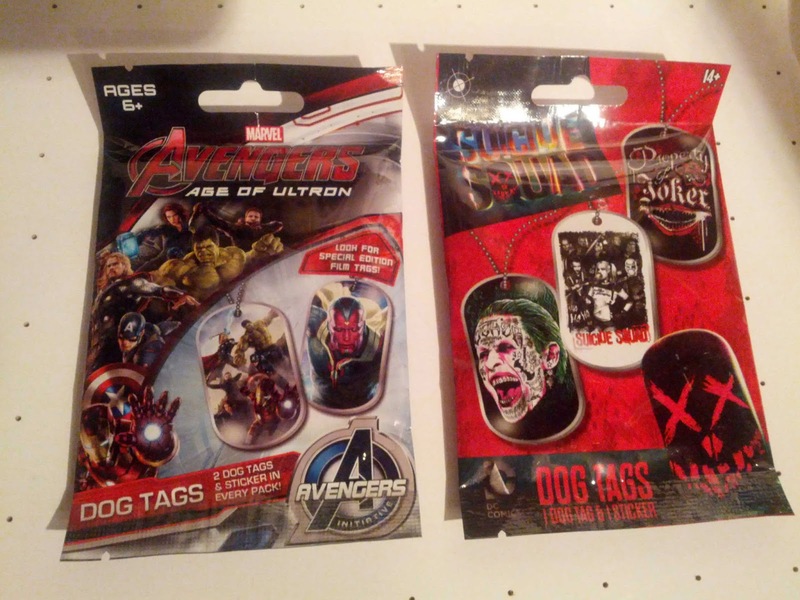 I don't wear dog tags and neither do my kids. I think they will be re-gifted this coming Christmas. My brother always enjoys the random box of stuff that I send him each year along with a Game Stop gift card. 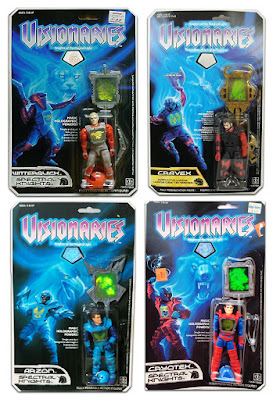 I have seen these around at toys stores recently, but most of the time they are in the clearance bin. From what I have seen, they never really caught on like fidget spinners did. They kind of look like fun. I will probably give these to the kids and see how long it takes before I wish I hadn't. I foresee a lot of clicking and frustration in my future! These I can use. Who doesn't need magnets? Especially parents with kids who want their latest and greatest school art project hug on the fridge. Once again Avengers: Age of Ultron was included in this assortment along with a Batman V Superman magnetic Metal Card! Can't wait to see if I get one of the randomly inserted Parallel Foil Magnetic Cards! These are probably my most favorite items in the entire box. I am a sucker for blind boxes, especially cheap ones. I am definitely keeping these! I hope I get a Harley in one of the packs. She is represented in both the Suicide Squad and DC Comics packs included in this collector box. Once again, this is a game I have never really been drawn in to play. I have a few of these figures from random giveaways at my local comic shop and they are actually pretty cool looking figures. 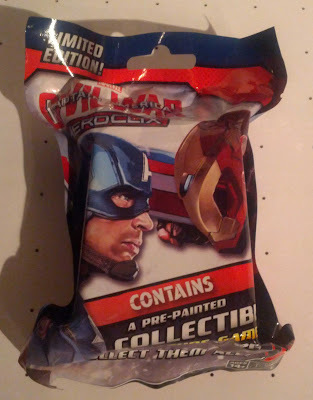 I will open this pack of Civil War HeroClix to see who I get, but more than likely it will not kickstart my need to collect more of these gaming figures. And there you have it! 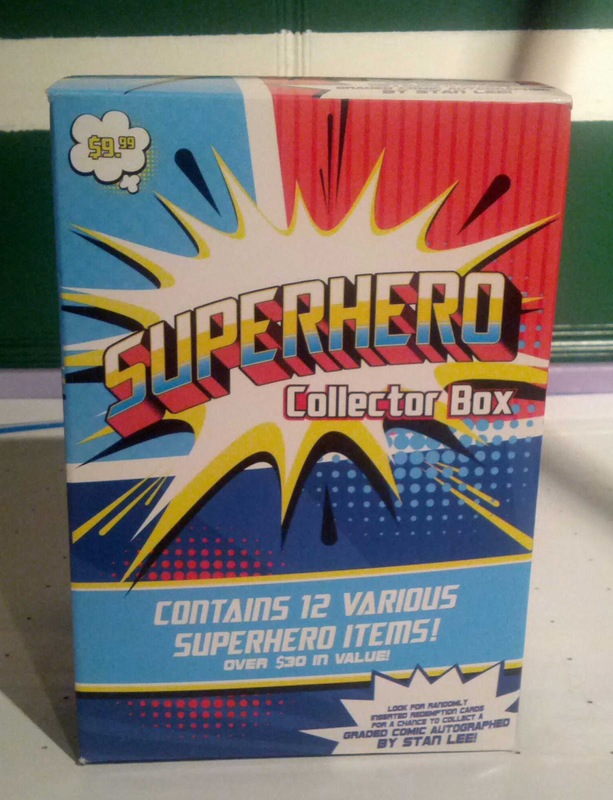 The 12 various Superhero items inside the Fairfield Company's Superhero Collector Box. Was it worth the $9.99? In my opinion, NO! Most of these items I have seen and passed on at the Dollar Tree. The box says it has a value of over $30, but I say $12. 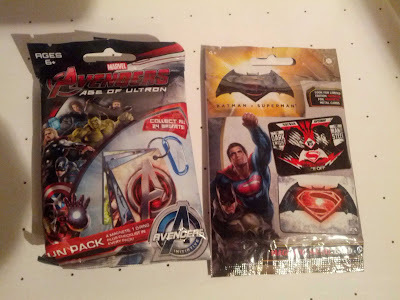 So, yeah I saved $2 over what I would have spent at The Dollar Tree, but I wasn't really excited about these items and I didn't win that Stan Lee comic! 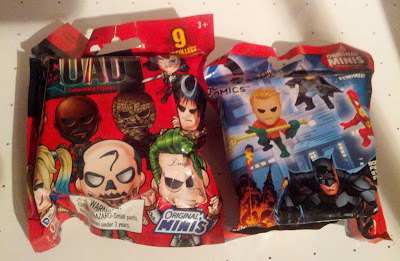 Now that I know what was inside, I would have rather saved the $10 to buy some actual comics. But hey, if you're a fan of Dice Masters, HeroClix or Hubsnaps I say give this box a chance. If not, save your money! • THE X-MEN and VENOM have been asking the wrong questions in the wrong seedy spaceport cantina! 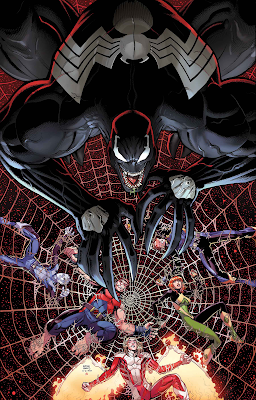 • Vicious SPACE PIRATES are bad enough...but they're even worse when they're using ALIEN SYMBIOTES as weapons! Recently while doing some cleaning around the house, I uncovered a relic from my past. It was my Creative ZEN MP3 player!!! I used to carry this thing around everywhere I went back when I was in college. 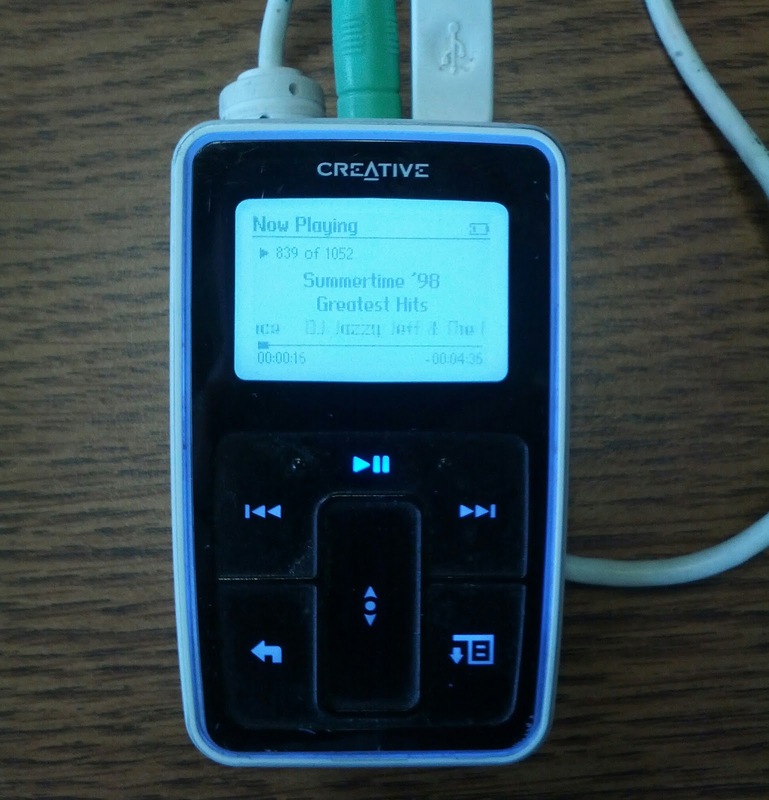 Not only so I could listen to some hot jams anytime I wanted to, but because I was a DJ during this period of my life and would use it at parties and other campus functions. Bonus Fun Fact: This song charted 4 different times over 3 decades! 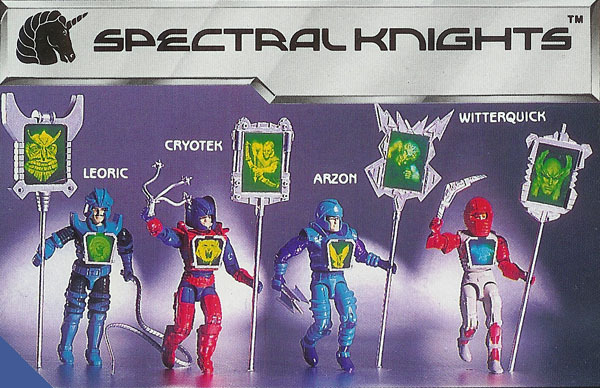 In 1987 Hasbro released a line of action figures called Visionaries: Knights of the Magical Light. The figures were similar to G.I. Joes in articulation, but were slightly bigger in size. The biggest draw in my opinion though, was the inclusion of Hologram technology into each figure, weapon and vehicle created for this action figure line. The toys were broken into two factions the Spectral Knights (good guys) and the Darkling Lords (bad guys). These two sides were granted special powers by the all-powerful magician Merklynn, not to be confused with his more successful cousin Merlyn. As the legend goes, after each knight completed a competition consisting of traps, creatures and face to face combat, the knights were given their special Visionary powers! These magical powers gave the knights special abilities including the power to turn into their totem animal form! I never knew that! Sounds pretty cool right? Well, I thought so. I did have the majority of these toys as a kid, but it wasn't until they were clearance for around $1 each at Kay-Bee Toys! 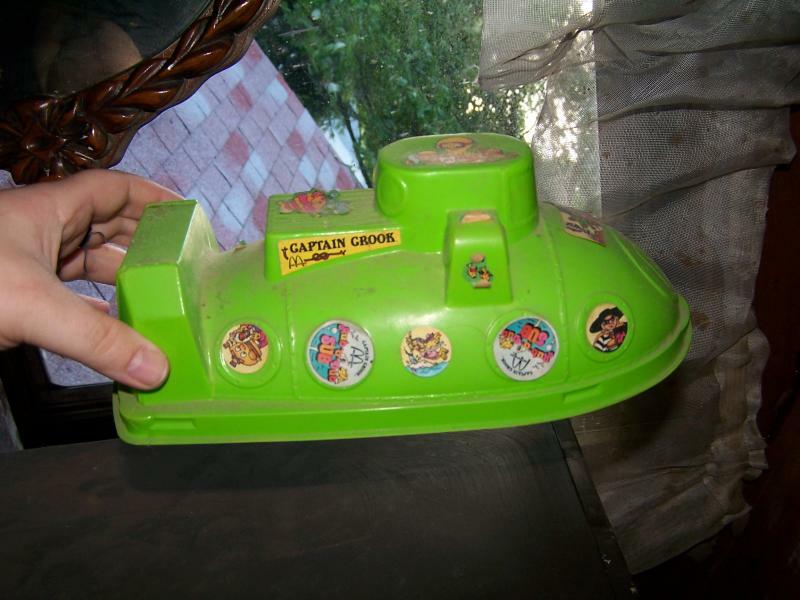 My Mom was always on the lookout for great buys and these toys were a great buy! 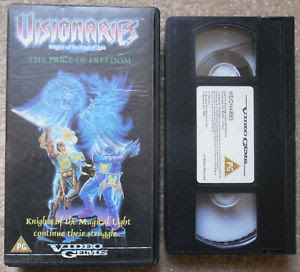 When Visionaries were released in 1987 the price point was a bit steeper than other toys on the rack due to the inclusion of all the Holograms on the figures. This may have partially led to the demise of this toy line. Another reason could have been the competition with other Hologram based lines like Supernaturals. Obviously there were some set backs with this toy line, but once myself and my brother added these Magical Knights to our collection, they became a favorite. Like I said earlier, they were similar to G.I. Joe figures and like G.I. Joe the Visionaries had some sweet rides including the Capture Chariot and Sky Claw! 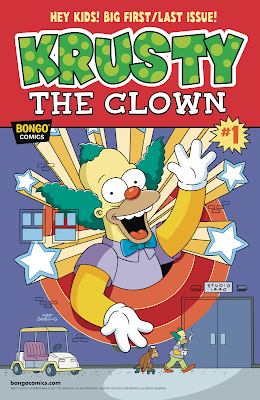 and Sunbow Entertainment produced a 13 episode cartoon program. With these resources behind them Hasbro expected another smash hit on their hands. 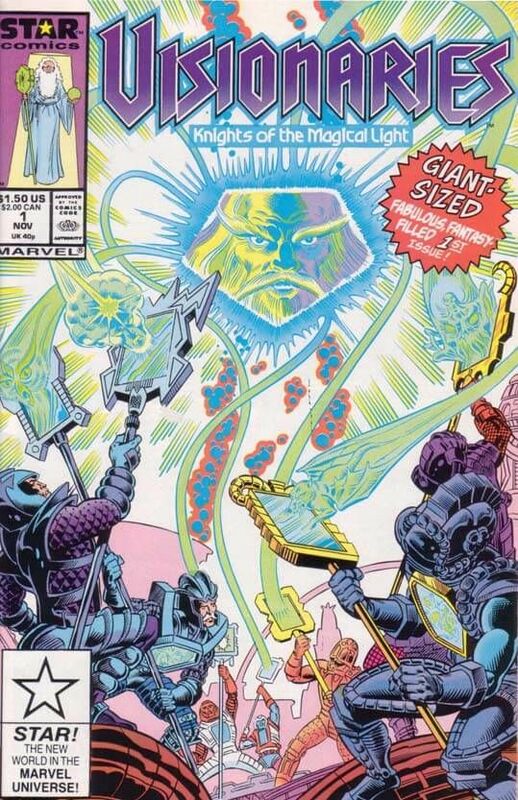 Unfortunately that never happened and the Visionaries faded into 80s toy obscurity. It's kinda sad, because these were actually some pretty great toys that I enjoyed as a kid. That's why I was so excited to hear that they were being resurrected by IDW publishing in the Transformers vs. Visionaries comic mini series! 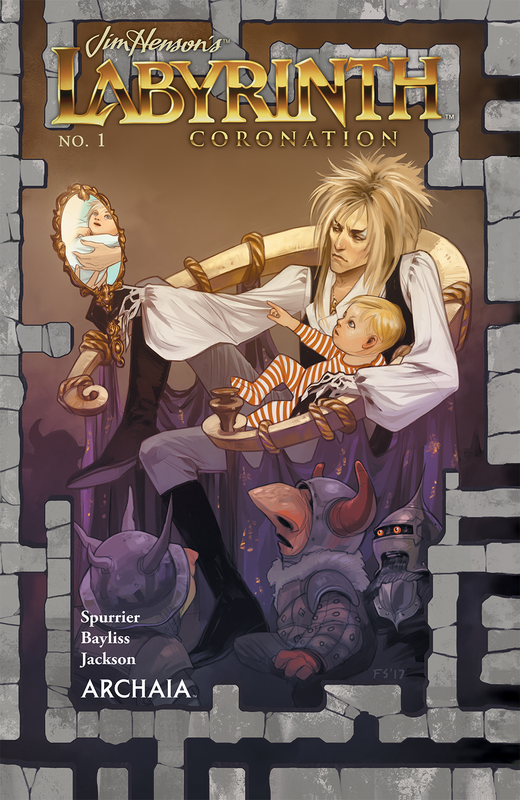 I have read the first 2 issues and I have to say...Its actually pretty good. There are some unexpected twists and the Visionaries use there animal totem powers to fight each other over their new home on Cybertron! 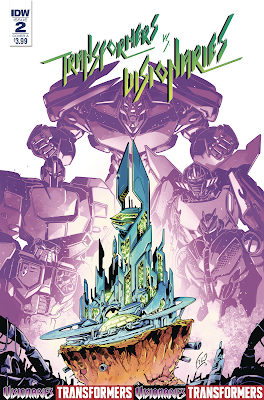 That's right the Visionaries are taking up residence in the home of the Transformers and some people are not happy about these circumstances. 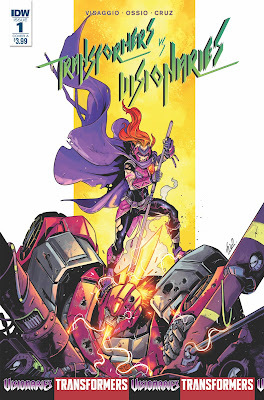 My only issue is that this series picks up where the IDW First Strike mini finished off, which I didn't read and left me confused in some parts. The comic does an okay job of recapping events and I can't wait to see where this one goes Hopefully the popularity of this mini-series will lead to an all new Visionaries ongoing comic by IDW? Only time will tell. 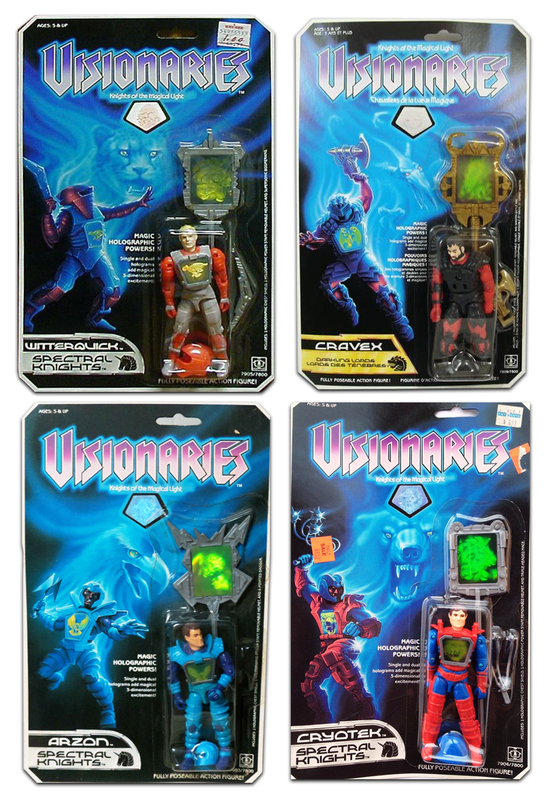 I'm just glad to see this forgotten toy line back in the spotlight or should I say...Magical Light? Terrible, I know! Now enjoy a clip from the first episode of Visionaries: Knights of the Magical Light! 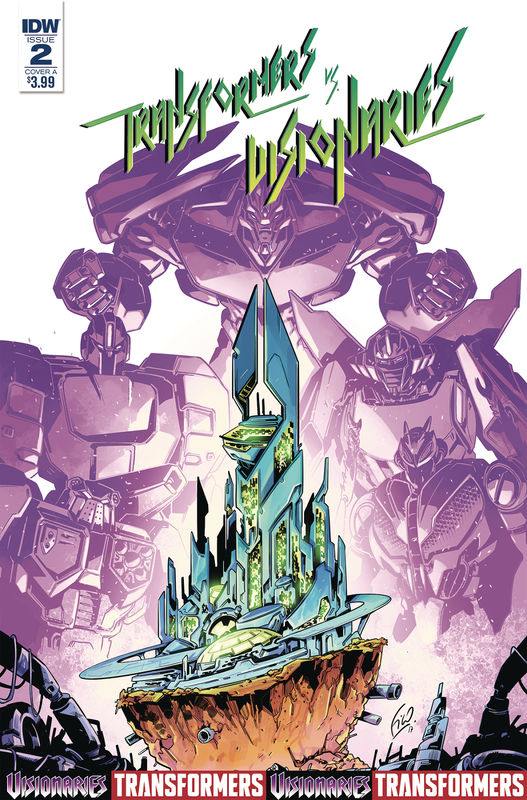 Virulina, leader of the Darkling Lords, has discovered that the Transformers are vulnerable to magic-and now she's using that weakness to try and gain control of Cybertron and wipe them out! Leoric and Ironhide team up to stop her, but quickly find themselves facing not only the Darkling Lords, but all of New Prysmos itself! I always loved Pee-Wee's Playhouse! Who didn't want to live their days out in that crazy place filled with talking chairs, robots, tiny dinosaurs and wacky neighbors! Even after the effects of his arrest in 1991, I still was a closet Pee-Wee fan. I remember kids revolting and destroying his merchandise right in front of my eyes. I will never be able to unsee a talking Pee-Wee doll thrown into a pond. His floating body just sitting their lifeless! Anyway...back to the now! 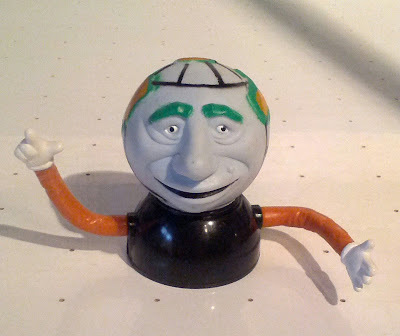 I saw this figure in a Goodwill grab bag and for a few bucks I had my own personal Globie! I always wanted a Glo-Worm doll, but never got one. The closest we got were these glow in the dark figurines. 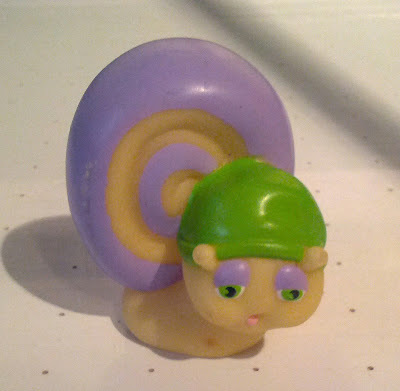 In addition to this Snail, I also had a Glo-Spider and Glo-Cricket. There wasn't any articulation to these figures, but they were great to play with after the parents shut the lights off for bedtime! 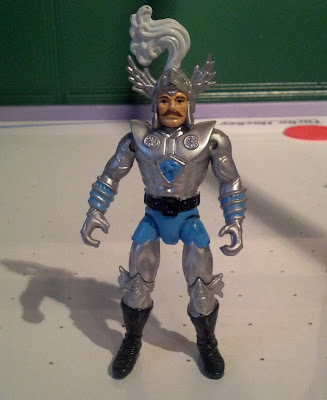 The LJN Dungeons & Dragons toy line is extremely underrated! 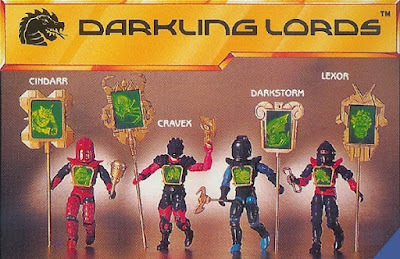 There were so many amazing figures in that line that ranged from sweet action figures (Warduke, Zarak) to huge evil monsters (Tiamat, Minotaur) to the amazing Fortress of Fangs playset! Once again, I found this legendary character in a grab bag at Goodwill. You can really find some good stuff there! My little brother was a huge fan of the Power Rangers and I must admit that I got sucked into the early years of the Mighty Morphin Power Rangers series. Mostly because of Ernie, the juice bar guy...not really. It's probably because the series was like a live action version of Voltron. 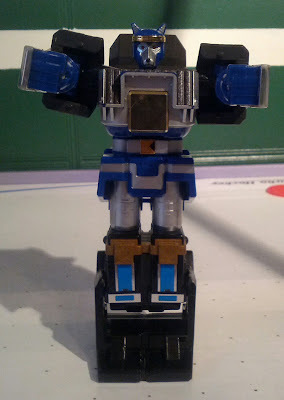 But with every new season my interest waned and by the time the Shogun Zords made it to Earth in an attempt to stop the baddies from space, I was no longer watching. But hey, it was Power Rangers, the toy was cheap and I ended up buying it! The California Raisins were a bunch of cool guys! They had their own set of sticker cards, a Christmas Special and even a few albums released! I owned the "Sweet, Delicious & Marvelous" cassette tape and it introduced me to such great songs as "Sittin on the dock of the bay" and "Tracks of my tears". What ever happened to these guys? You can listen to their hot album tracks in the YouTube link below...ENJOY!